The ImagiWorkers were commissioned to design and develop all branding and associated design works for the startup small business “Springkell Gardens”. 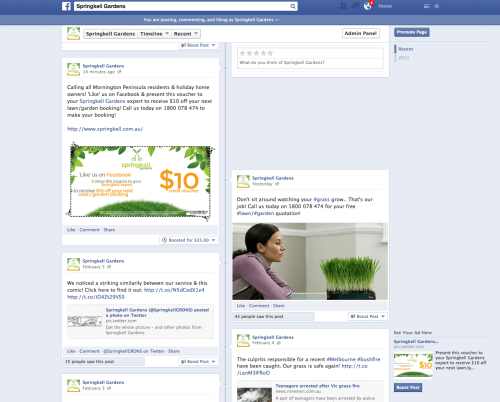 Operating across the Mornington Peninsula, ImagiWorks acted as the in-house marketing and design team for the lawn and garden experts as we design, developed and executed a string of campaigns including a logo, a website including strategic blog posts, a GEO-fencing compatible mobile application, marketing coupons and flyers, a placement ad in the local Leader, business cards and e-mail signatures, social media profiles and associated promotional campaigns and an animated advertising video. 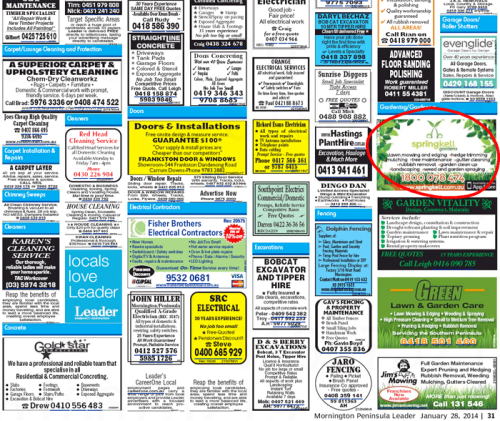 We strategically executed a brand awareness ad placement campaign in the local Mornington Peninsula Leader to coincide with the region’s peak periods of December and January. Customers can utilise the loyalty card system within the custom-built Springkell Gardens iPhone application to redeem a 50% reward off a 5th booking. 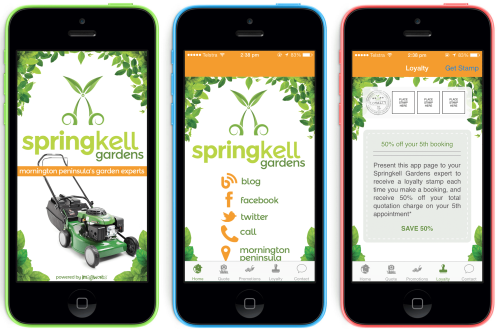 A Springkell Gardens expert digitally stamps the mobile app to keep track off lawn and garden appointments.